Meet the Ticos. Most Costa Ricans affectionately refer to themselves as "Ticos". The word derives from hermanticos, meaning "little brothers". If speaking exclusively of girls or women, the feminine is used… Ticas. Ticos are generally family-oriented, peaceful and fun loving. Indeed, most Ticos do not like conflict and are slow to argument. Many love to dance and communities are often immersed in celebration. Costa Ricans have many beloved national holidays. Traditional food is also a significant part of the culture, as is coffee. Coffee is grown in several prominent regions of Costa Rica. Social status is fairly homogenous. 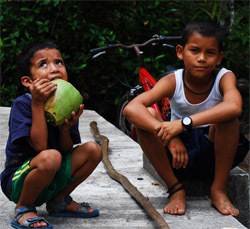 The Ticos are also well-educated and boast a 93% literacy rate. The overwhelming majority of the population in Costa Rica is middle-class. These statistics are a tribute to the country's strong democratic system of government, which promotes equal opportunity. Upper class "elitists" are small in numbers. And while extreme poverty does exist, it's not near the magnitude of Costa Rica's Central American neighbors. Religion in Costa Rica. Ticos tend to be faithful but not fanatical. Over 77% of Costa Rica is Catholic. Although many people do regularly attend mass, the religious culture has been described as a "lukewarm" practice of Catholicism. Even during colonial times, the church did not hold powerful influence over politics or culture. Ethnic blend. Most Costa Rican are "Mestizo", a mixture of Spanish heritage stemming from the Columbus explorations and Spanish conquests of the early 1500s. That European influence certainly shaped the culture. Some indigenous Native Indians remain in Costa Rica, although most communities were decimated by conquests or forced to meld into a blended culture. Still, there is much interest in these native peoples and their contribution to Costa Rica's history. About 3% of the Costa Rican population is of Afro-Caribbean heritage. In the late 1800s, Jamaican immigrants were attracted to employment opportunities on railroads and banana plantations. Most of their descendents still live in the province of Limón and speak a lovely dialect of English with a Caribbean lilt. There are also ex-pat North Americans and many Asians living throughout Costa Rica. The cultural hub. Costa Rica's capital city is San Jose—it remains the country's cultural center with a plethora of venues for music, art & theatre, opera, museums, the symphony and other cultural activities. Eco-tourism is important to the Costa Rican economy. With over 150 outstanding parks & reserves filled with incredible wildlife, it's clear that Costa Rica is a national leader in conservation. Ticos that work in the Costa Rican tourism industry, often combine their friendly spirit and national pride to welcome travelers and visitors. Combine the lovely Costa Rican culture and wonderful people with the country's amazing natural beauty and diverse landscapes. Add in an endless array of attractions and a fantastic list of things to do, and you have yourself the ideal vacation destination. History — Read about Costa Rica's rich history. Government — Find out why Costa Rica is such a successful nationa. Holidays — See a list of national holidays in Costa Rica. Foods & Recipes — Learn about Costa Rica's traditional cuisine. Find or share a recipe. Costa Rican Coffee — Discover the best of the best and order a bag of your favorite. Arts — Get hip with the music and theatre scene in Costa Rica.